Two days ago I ordered a pink pom pom from Rue de la Fete.com. It was 2.90€. I wanted it for Saturday so I paid 9.40€ for shipping. My order was confirmed via email and then again for the delivery, then I received an SMS with delivery confirmation details and what to do if I would not be available between 8h00 - 13h00 (1pm). I was home all morning, working on my computer. At about 12:30 I was getting ready to leave and finally decided to check the website on where this delivery was. First I tried on my mobile but had user problems with order#, conf. # etc. (I figured it out by the time I got to the website.) I got a confirmation page showing the order had been delivered and signed for by "Joubeau" (which is a part of my married name). I was very amused by this considering I'd been upstairs in my apartment all morning and hadn't left and yet I had also, apparently, signed for a package! I decided to go downstairs to the mailboxes and see what might be there. Jammed in my mailbox was a plastic envelope with said item. Aha! And yet, why did the delivery man decide to just jam it into my mailbox instead of ringing my buzzer and either delivering it or asking me to come down the two flights of stairs to get it? When I opened the envelope I realized in my excitement about ordering said item, I didn't see it was only 1 pom pom and not 1 pair. Doh! So...I went through the whole process again, paying 2.90€ for my pom pom and 9€ for shipping. 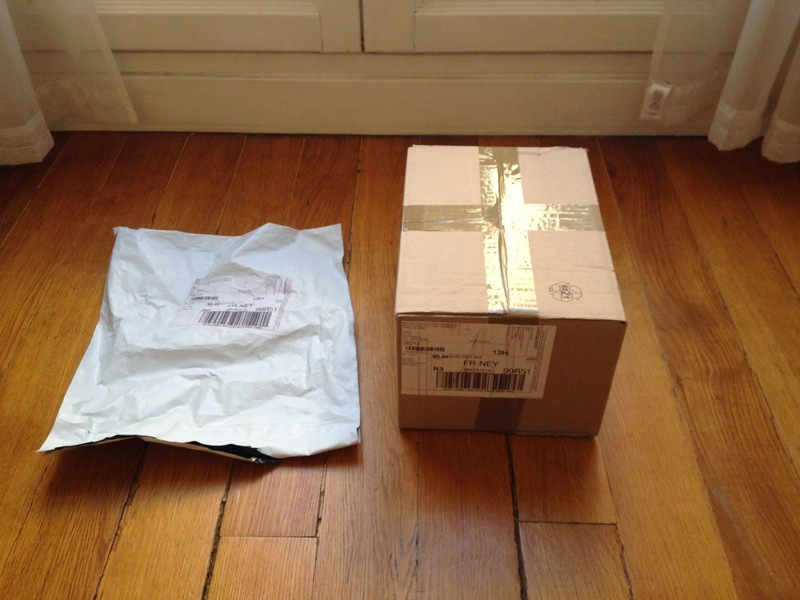 Today I went downstairs and put a post-it on my mailbox saying, in French, "Dear Mr. Chronopost. I am here. Please ring. A thousand thank-yous!" and signed my name. Mid-morning my buzzer rang and it was Mr. Chronopost. I met him half-way and was surprised today to see a medium-sized box. I'm really interested in what's happening at the other end of a company that ships the same exact item but using different packaging. Is it a human "error" with someone deciding one envelope or box is more efficient than the other? Did they run out of envelopes? 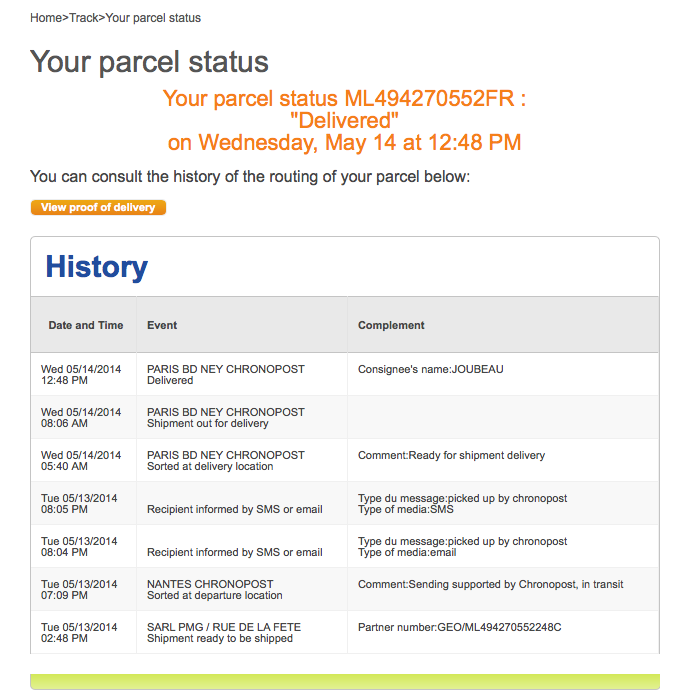 Are they using a different fulfillment agency? Anyway, I am happy to now have my two pink pom poms, despite the round-about-manner in which I got them! I'm on a roll with my posts regarding inefficiency and poor web design. Today I'd like to focus on a part of our sidewalk/bus stations that is not well thought out at all. In 2012 they started construction work on a new building. As a result, they closed the bus stop (heading towards Opera) on our street. However, this hasn't been the worst of the problems. The problem with the bus stop for the other direction (heading towards Port de Saint Cloud) is that it is on a rather narrow sidewalk to begin with. 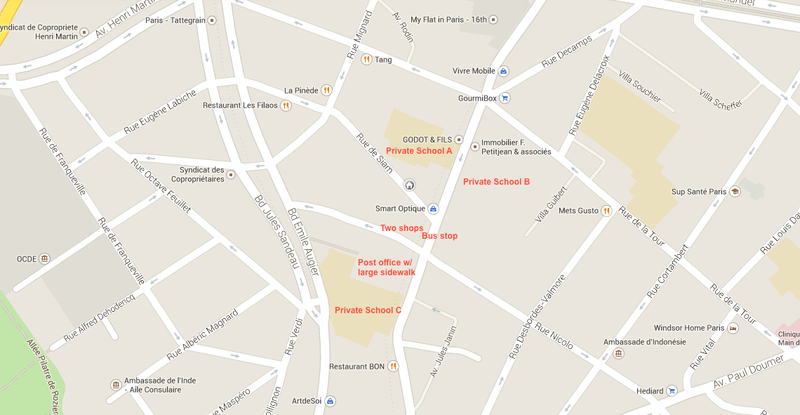 It is also directly in front of a Bande Dessine shop and a fruit stand. So, you have people waiting for the bus in the same space as people trying to go in and out of two shops. This would not be so frustrating if there weren't three major private schools literally 1 building apart of each other on both sides of the street, right near this bus stop. What makes it more baffling is that there is a large space in front of the post office where cars can park temporarily (delivery spots), that is literally on the next corner and has a HUGE, MASSIVE sidewalk area and 2 benches for people to wait/sit on. Even in normal times this would make more sense traffic/circulation-wise. But with this deviation for the construction, it frustrates me to no end that they couldn't shift the bus stop 10 feet across the corner. What adds to the frustration is that, as mentioned above, there are three major private schools within 25 feet of each other. 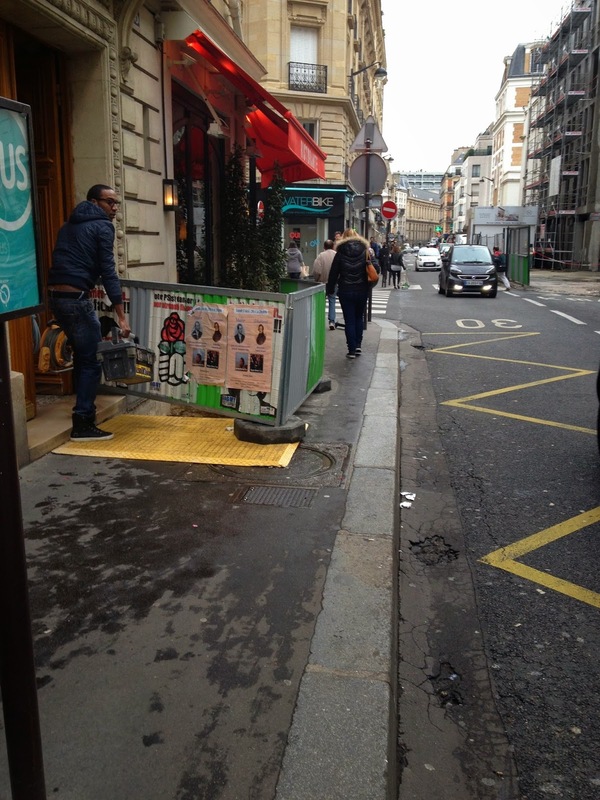 Inherent in this point is the fact that there are hundreds of families typically with a stroller and 2 children holding on to each side and/or rolling by on trotinettes (scooters). These families are all rushing to these schools, or passing them, as we do, to go the public maternelle 10 minutes away. Plus there are cars of people who've dropped their kids off at said schools, merging into the main street. So there are literally hundreds of people, elderly people and CHILDREN who are at risk of getting pushed into the street as a car or bus is approaching. I greeted the owner and asked if we could see the carte (menu). She looked right at me and said, "oh no, the restaurant is full." I guess she meant she already had all reservations for lunch. 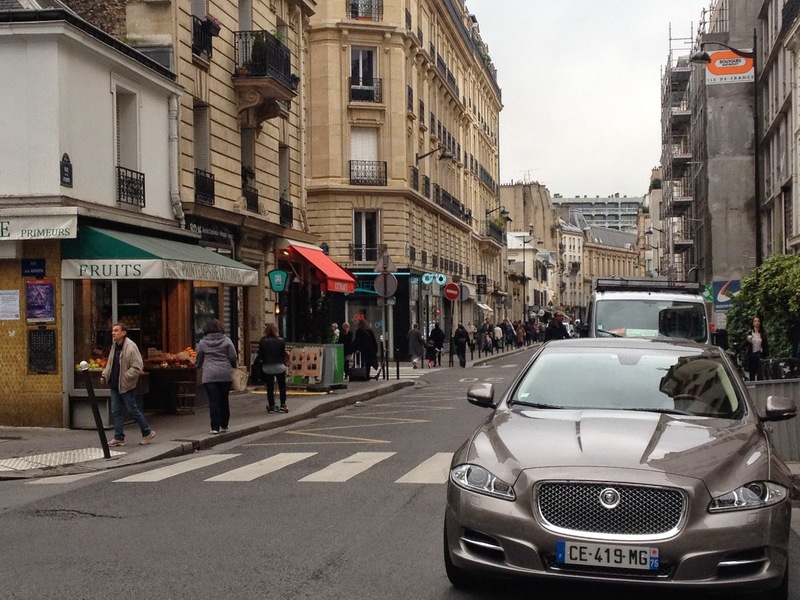 I asked her if she knew of a brasserie in the quartier (neighborhood) and she said "No." As I said, "merci" and "au revoir" part of me chuckled thinking she probably just didn't want a 4-yr old in her restaurant. No matter. We went up the street, with our jackets held tight against us, in the chilly rain to another restaurant on the corner. As I spied another white-tableclothed restaurant with lots of wine glasses I decided our best option was to just get the heck out of this area. We crossed the street again to catch Bus #70 back towards home. Halfway through our route we stopped at a corner where there were lots of restaurants and a manege (Merry-Go-Round). I asked Simon if he wanted to eat here and then go on the manege. Of course he said yes, thinking only about the menage part of this equation. We went across the street to a Bistrot Linois. I ordered a poulet roti (roasted chicken) and mashed potatoes, and for Simon a plate of fries and a glass of milk. The order arrived quickly. Simon's fries were of the frozen variety and were hard and tasteless. My purée was, I'm pretty sure, the powdered kind. And my chicken was cold. I wasn't too interested in the puree anyway but I couldn't eat cold chicken. I told the waiter, "I'm sorry but could you please reheat this chicken again? It's cold." He apologized profusely and whisked it away. Simon and I enjoyed our time chatting and when my dish came back it was piping hot. I'm in a new meal-time regime with my Son and I could tell he wasn't going to finish his fries so we paid the bill and left. Merry-Go-Round time! In the rain! After two turns, we hopped in a shiny blue Mercedes taxi and made our way over the Grenelle Bridge to see the backside of the Statue of Liberty*, up the hill, and back home. * The Statue of Liberty faces West, towards her "bigger sister" in good ol' New York City. Today is a national holiday in France. It's Labor Day. And it is raining. So, since my son is home from school, I looked and found some children's films, and my son got excited about the band-annonce for Le Parfum de la carotte. We quickly moved from lazy-day-in to ready-to-go in a short 1/2 hour. 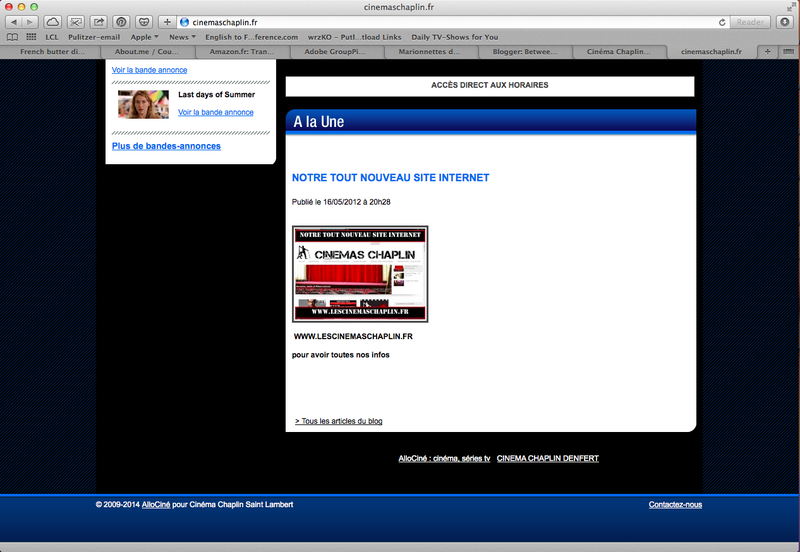 I planned our trajectory on the good ol' RATP website (Paris transport site). We walked to our corner and I scanned the QR code at the bus stop to get the next arrival. 11 minutes. Simon wanted to wait as he amused himself looking at the BDs (band-dessines/graphic novels) in a shop window and fondled pears at the fruit stand. The parents of one of his friends walked by...we chatted and they went on their way. We waited. And waited, and continued to wait. I checked the QR code again. Now 3 minutes. About 5 minutes later the bus lumbered around the corner. I guess considering it was Labor day, the bus driver didnt want to labor too hard...He inched his way towards us. I've now waited about 20 minutes for the bus and considering we had to catch a 2nd bus (#70 at Radio France) I felt we were never going to make this movie. We got on the bus. It lumbered forward. We got out at our stop. Eureka. A cash machine. I got some cash. I hailed a taxi but he didn't want to wait for me. We walked to our next bus stop. Saw another cab, hailed it, and it stopped. We arrived at the theater. There were about 50 families standing outside, in the rain, waiting. 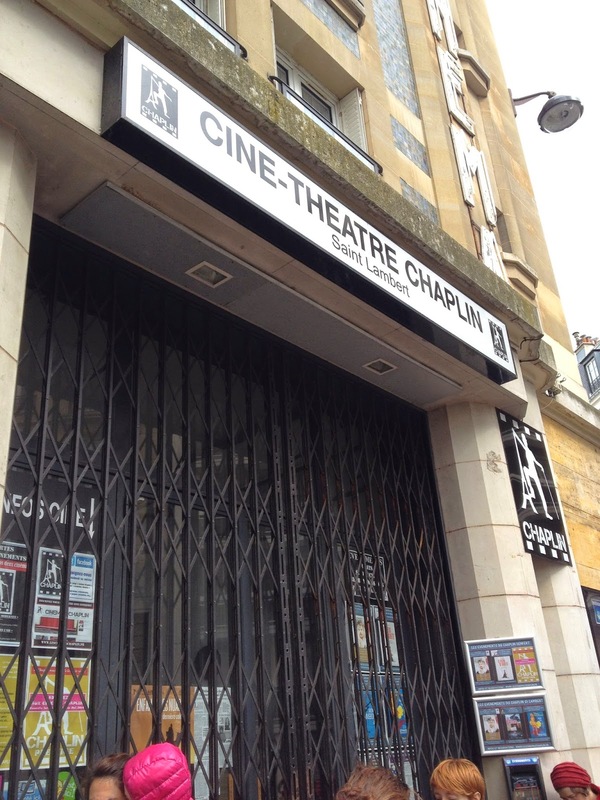 The theater was dark and still had the accordion gates closed in front, locked with a bike-lock. Parents were checking their cell phones. No one is talking to each other. No one. The few parents who are checking their phones are not sharing any information with anyone else. 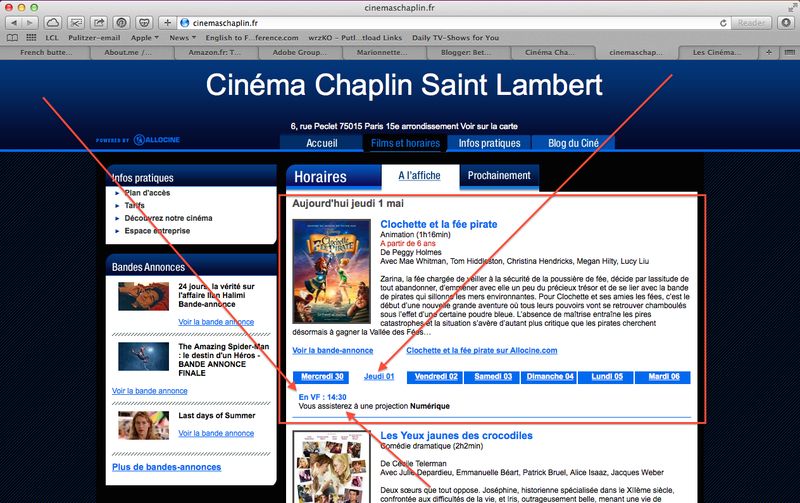 After about another 15 minutes I over-hear a mother explain to another that the website of the theater shows the first film of the day to be Clochette et le fée pirate (Tinkerbell and the Pirate Fairy) at 14h30. 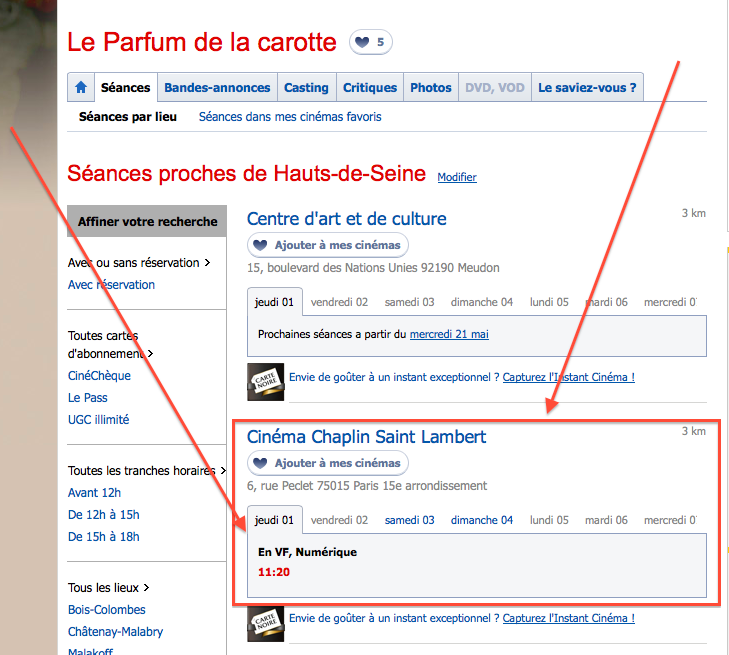 However, the Allocine.fr site (the major film listing site in France) lists Le Parfum de la carotte at 11h20. The text announcing the new site, the image of the new site and the text link of the new URL ARE NOT LINKED. If you click on the new site you get the same page but with more different colored fonts, underlined text and nearly unintelligible mishmash. 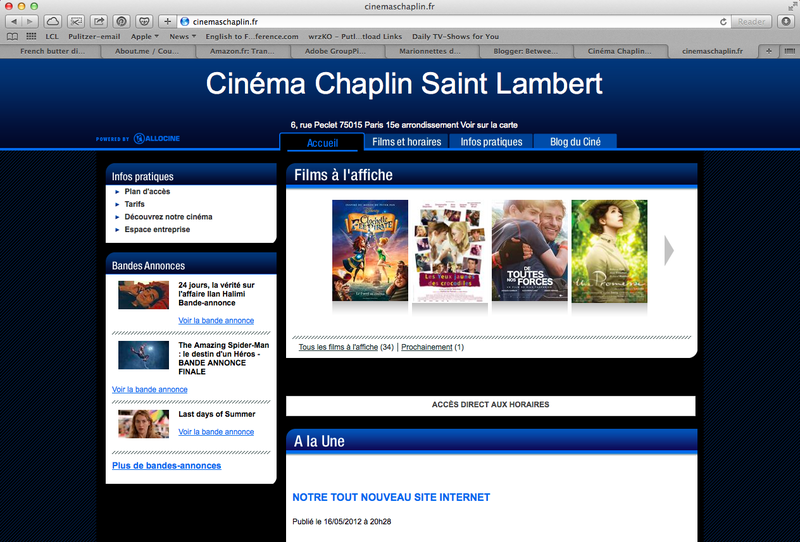 You cannot go to the new site unless you highlight the text, copy it and then paste it into a new browser tab. This is not convenient from a mobile phone that is dropping wifi/internet connectivity. Their phone number is NO WHERE. I am on the phone with my husband and he is researching all this on the internet from his office in the South. As he is doing this, a man drives up in a black "Cinema Chaplin" van. He races out and apologizes saying his child was sick and his wife...(didn't catch that part)...and he's sorry for the delay but, yes, he will still put on the film for us even at this late hour. Yea! Our patience, and confusion, paid off! After about another 10 minutes of this poor man running to set everything up, he unlocked the doors and ran behind the caisse to sell tickets. We got our tickets and, with about four other families, enjoyed these delightful short animated films. Classic, precious, French animated films with wonderful stories and music.